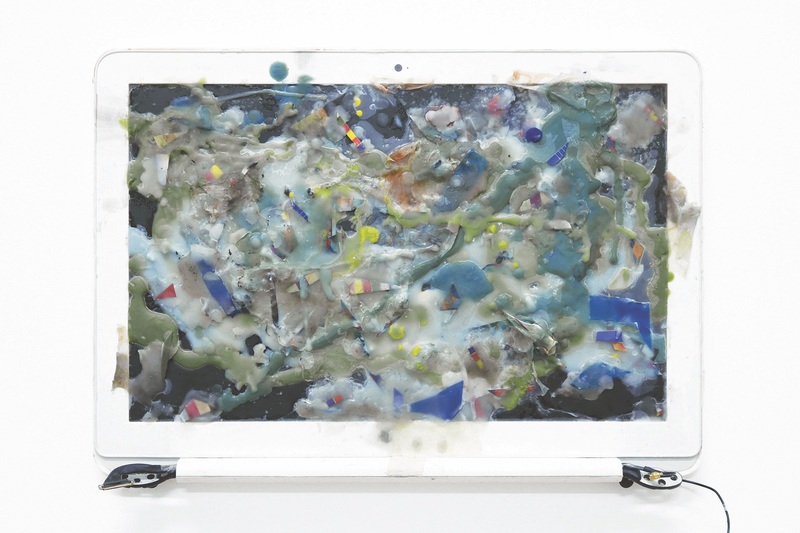 Sunday, March 25, 4:00 – 7:00 P.M.
Shadows of Thought, 2018, 9 x 13 inches, wax, detritus, and urethane on screen. Melting the wax, fire was an agent alongside my guiding hand. Screens, like fire, emit light. We look into screens, into fire. Not at them, but into them. That’s how we are conditioned. Screen. Fire. Light. Screen, fire, light. There’s a primal association with fire, with light, and primal reactions to this thing, weaving in and out, weaving through the principles of the universe. And light is why. But the screen is dead. The surface is an index of fire, scattered trash and gestures of indirect touch. Light is why, but it’s not all. What about its shadows? It’s absence? The parts it doesn’t get to without abstracting? Within you. In reflections, their differences are felt. One bounces, illuminating elsewhere, a world of spectrums. The other doesn’t reflect at all, it submerges. Submerged, reflect all you want, you will still only see shadows. You wouldn’t even know. But imaginary abstractions are just as real. Shadows will nurture invention, a world of spectres. They’re not in here, they’re out there. I mean they’re in here, not out there. Right here. Stay, in this palpable invisible place. Feel around. You’re inside out. Harness vision and look in, deep, like you look into light. Does this perception perform sight like shadows behave? Indulge down here, and you can take back what you find if you don’t let it go. Stay. Assimilate. Survive here. Find a new set of instincts growing inside you. Cultivate them. Now who are you? Discover again… go further… ten more steps, go on. Inwards, dive out. Ten, nine, eight, seven, six, five… four… three… two… one. Now DROWN. Imagine that you are here. You are. Now think about something else. Gregory Bae manipulates common machines and appliances to create images and installations that recall experiences of seemingly indifferent phenomena. For this exhibition, Bae channels simultaneous impulses to disconnect from, and to engage with the world; New Instincts explores a state where both of these desires resist, parallel, and embody one another, searching to articulate forces both within and external. Gregory Bae lives and works in Chicago. He is represented by FL Gallery in Milan, and Harrison in New York.